When you first get a puppy, your first instinct is to take as many pictures and videos as you can. That way, you can always remember how impossibly cute they were. 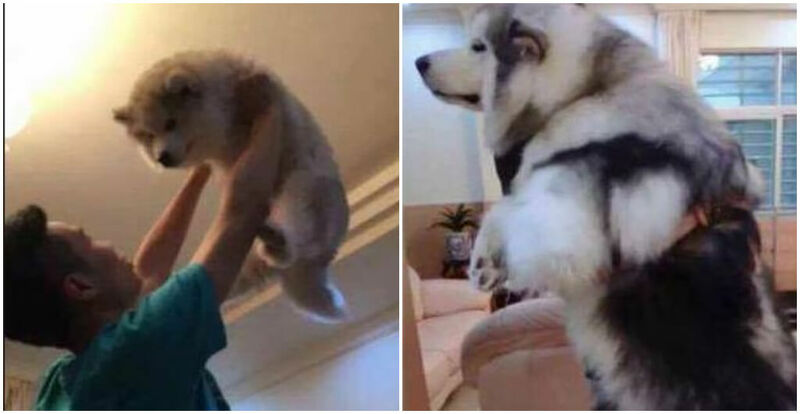 Sometimes, when you look back on these pictures, you may notice that your dog still has the same tendencies from when it was a young pup. 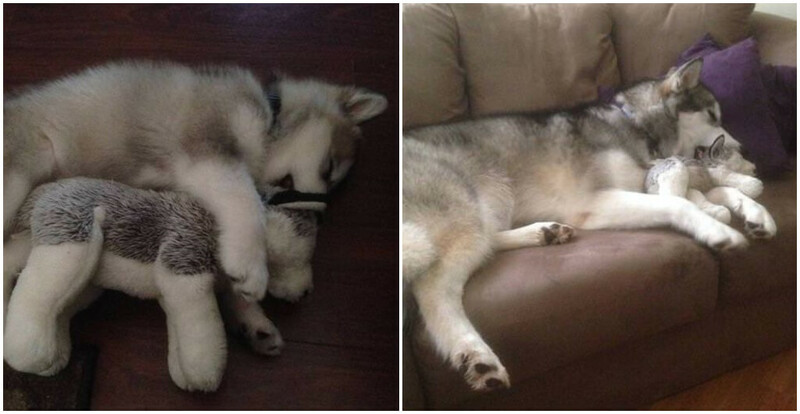 Whether it’s sleeping with the same toy, laying under the same counter, or the way it sits in your lap. They’re the same dog they’ve always been. 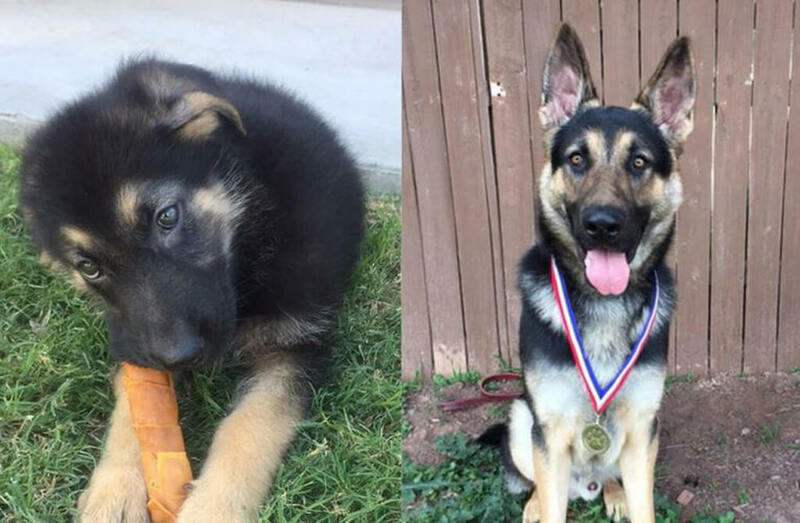 So here are some pictures of dogs doing the same things as when they were puppies and how they’ve changed along with their owners. 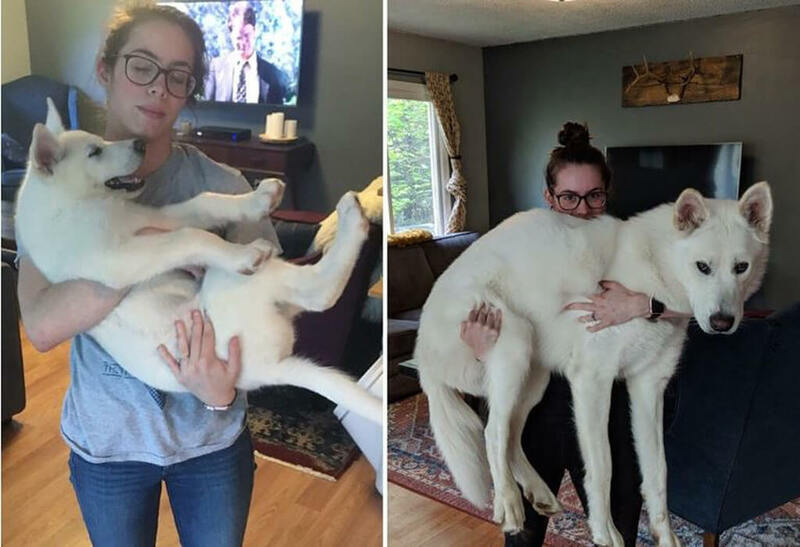 As if this puppy wasn’t big enough to begin with, we’re pretty sure that the owner could now put a saddle on the dog and ride it. If we didn’t know any better we would think that this was an obese wolf in the wild. Look at that smile. These two dogs have probably been through a lot together. Lots of shared meals, lots of time destroying things together, and plenty of naps. They’re just as cute today as they were when they were curious puppies and now they have nothing but smiles for their situation. This is either a very obedient dog that is willing to take pictures, or it just really likes that spot. At one point, it may have been a little difficult for the dog to get up there, but not anymore. These pictures couldn’t have been taken too far apart because the yard looks exactly the same too. 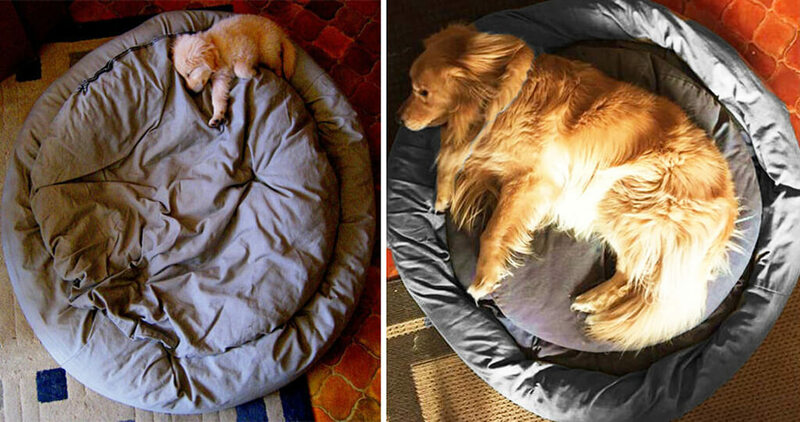 Did The Dog Get Bigger Or The Bed Smaller? Back when this dog was a puppy, its bed was ten times bigger than he was. He could roll anywhere and probably never fall off. Now, the bed is a perfect size although we’re sure this dog is dreaming about better days when they had the comfort of their mega-bed. 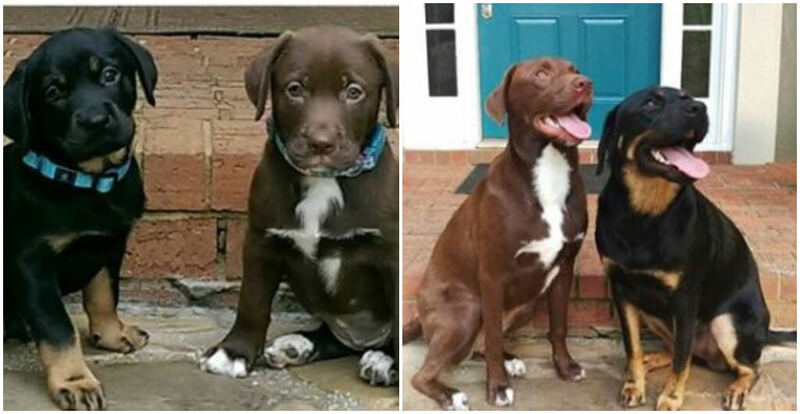 These lab puppies look so young and confused compared to their older selves who look strong, confident, and wise. 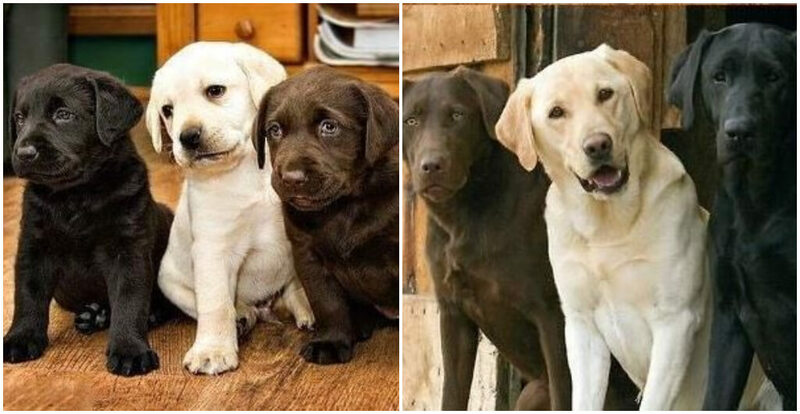 It’s clear that they have been inseparable since the first picture was taken and have established their own labrador family. However, we’re sure that letting these dogs crawl all over you is a little different now that they’re grown. It’s no secret that dogs like to make friends, usually with other dogs. But these two are proving that different species can be friends as well. 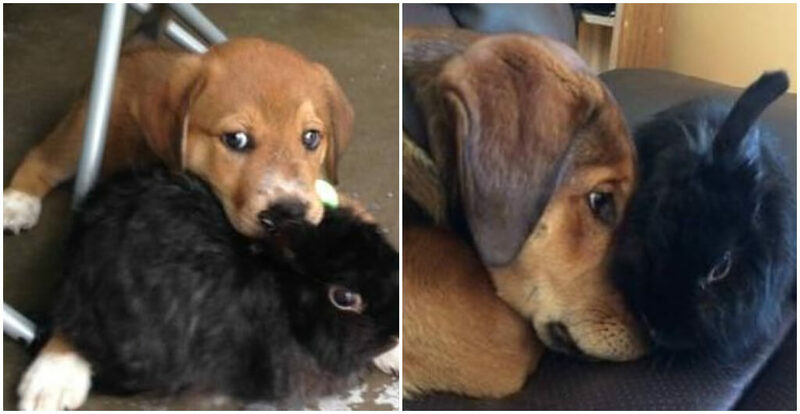 Since this dog was a puppy, it loved its rabbit friend and nothing has changed. However, we’re sure that the rabbit is happy that the dog has calmed down since its puppy days. 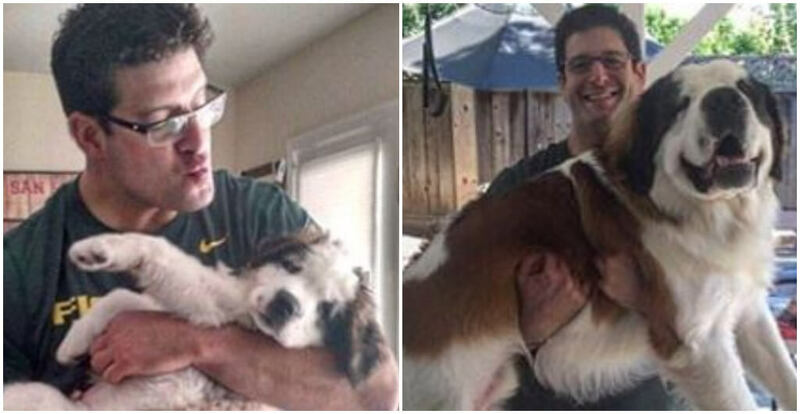 While in the first picture we see a little girl and a puppy, in the other we can see how much has changed. 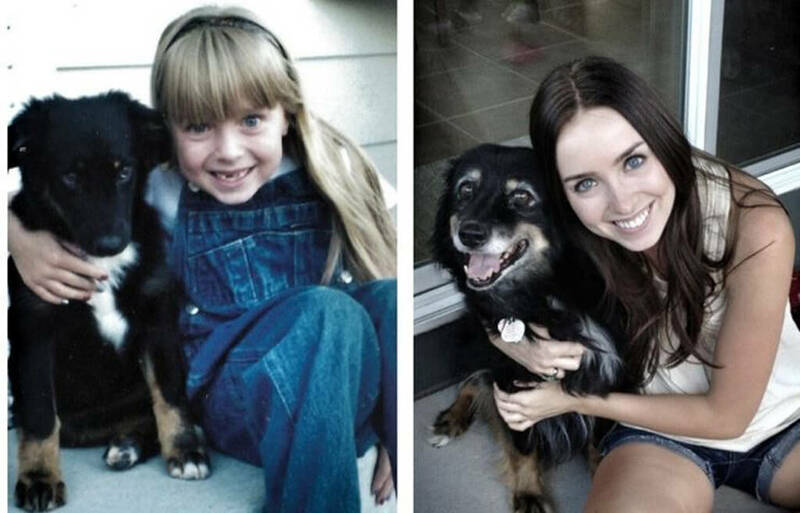 The dog is now old and the girl has grown up. However, neither of their demeanors has changed. The girl seems happy and the dog is content being held by its owner. This dog’s eating place also used to be the perfect place to take a post-dinner nap. 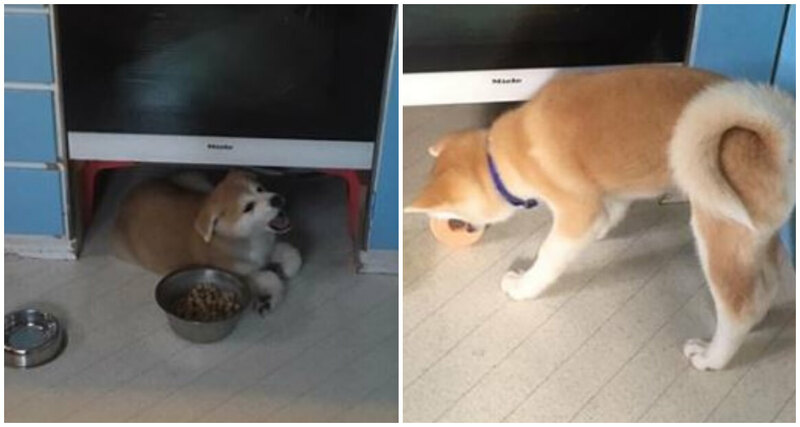 All they had to do was slide underneath the opening in the cabinet and he was good to go! Unfortunately, he looks a little too big to do that anymore and has to find somewhere else to sleep off the big meal. It appears that when these two were puppies, they found a laying position that they could both agree on, or maybe not. It’s possible that over the years the black dog eventually got used to it and maybe even grew to love it. No matter what, it makes for a good picture. 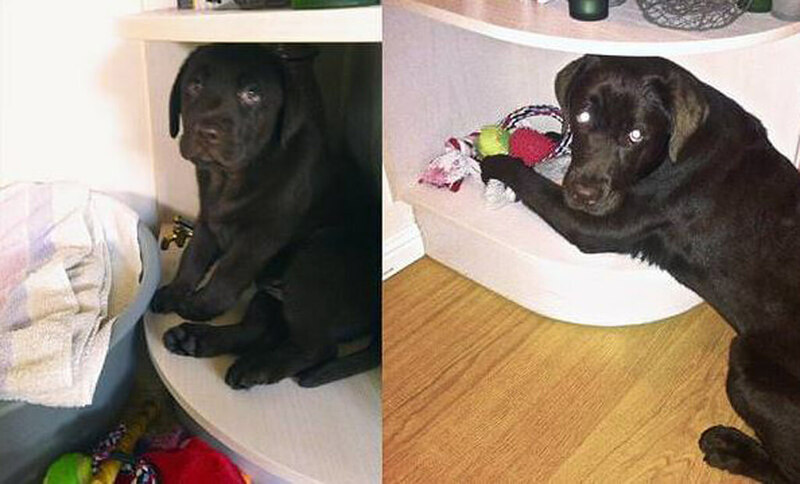 It looks like it didn’t take long for this puppy to find his favorite napping spot. Surely, at first, the big dog put up with it but now it doesn’t have a choice. Even though the big dog may look annoyed, we’re positive deep down he actually enjoys it. This picture is spot on. Just about everything about the two pictures is the same. Same background, same owner, same dog, even the same shirt. 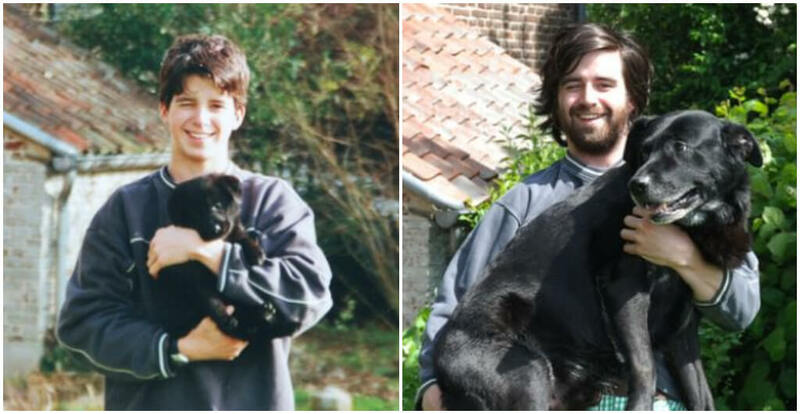 All that’s changed is that 10 years have passed since the first one was taken. Both the dog and its owner look just as happy too. 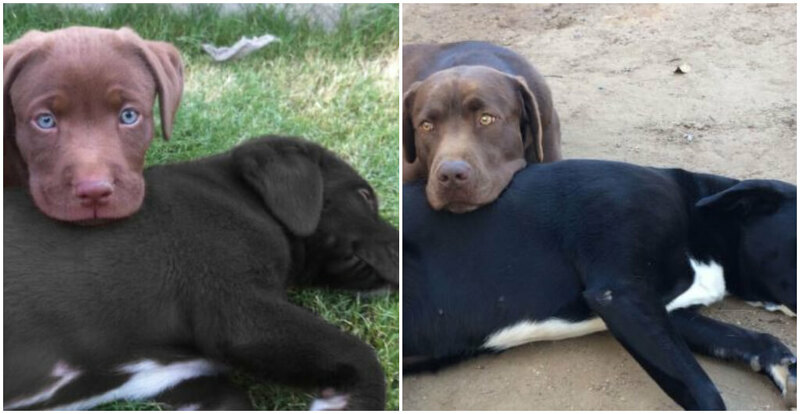 Sometimes, when they’re young, dogs find a spot that they love and it’s game over. From then on, that’s where they like to hang out and that’s final. Apparently, even when they’re too big, it won’t stop them from trying. Look at this Corgi for example. That can’t be comfortable but he doesn’t care. 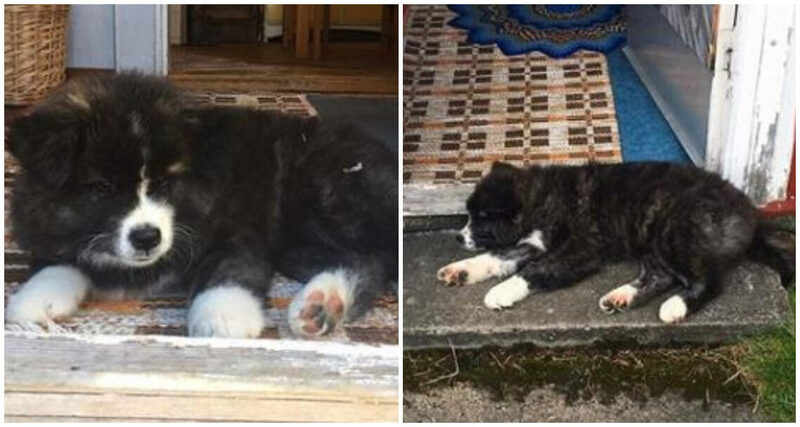 Just by looking at these two pictures, it’s clear that the dog has become much more comfortable at its new home. At first, it may look a little scared and confused, but now it has its legs spread, tongue hanging out, and knows that it’s part of the family. Like we said earlier, if your dog decided it likes a certain spot, it’s theirs now. Even if it’s the chair you keep in your office, you might as well just go buy yourself a new one. 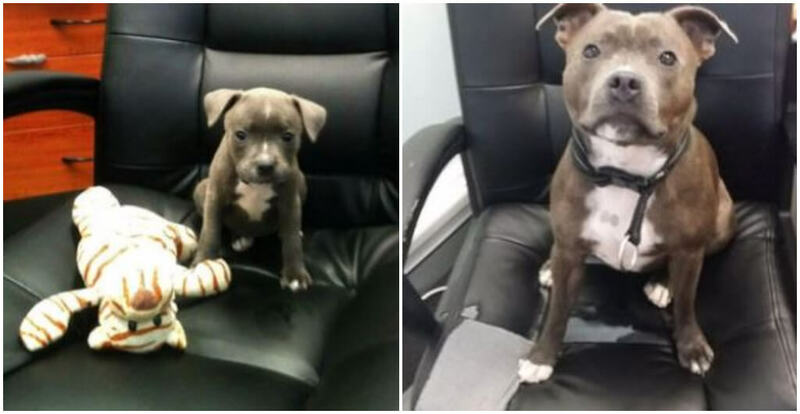 We bet when this dog was a puppy it had to be placed into the chair, but not anymore. The owners should never have put them there in the first place. Sleeping with your new pup is all fun and games until they become almost as big as you. 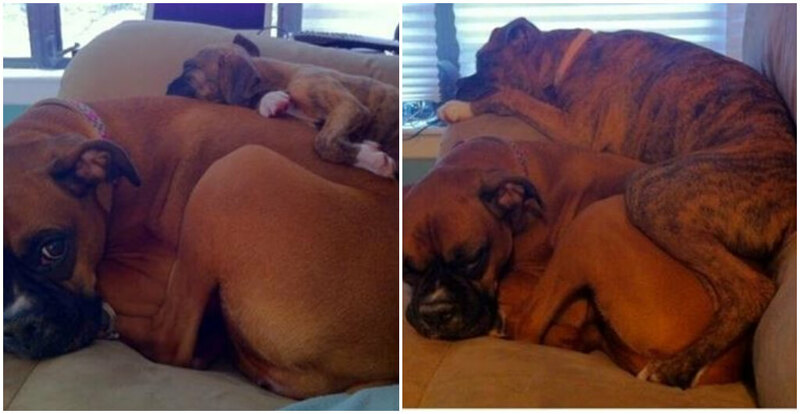 Since dogs don’t always understand how really big they are, it can be like sleeping with an adult-sized toddler. There’s no personal space and no consideration of your comfortable sleeping. The things we put up for these dogs. We’re not sure which one is more breathtaking, the cuteness of the puppy or the size of that dog! That beast looks like something straight out of The Sandlot! That owner doesn’t even need a bed, he can just lay on top of it! Hopefully, it doesn’t like to jump on people because that could be painful. Back in the day, this adorable little corgi had more than enough room on the couch next to his favorite British flag pillow. Now, not so much. However, that doesn’t seem to dissuade him from assuming the position on his spot on the couch. 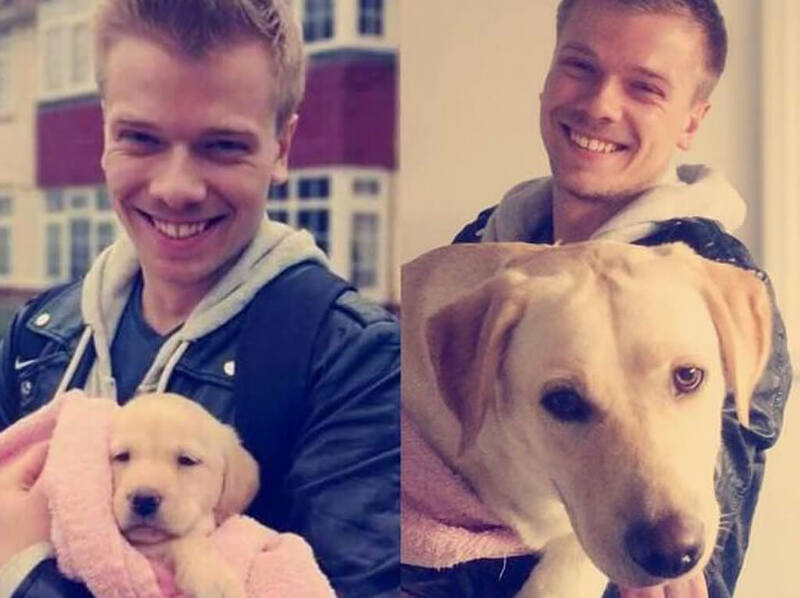 It’s possible that this guy got a puppy without knowing the breed of the dog. When it’s a puppy you can’t even imagine it growing to that size because they’re so small. Yet, after some time, he might have realized what he’s gotten himself into. Luckily, he doesn’t seem to mind and is happy as can be. 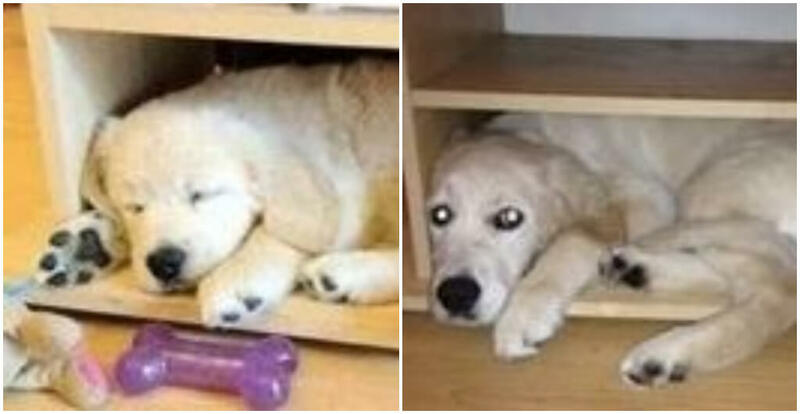 We’re sure these owners were happy when they discovered that they didn’t even need to buy a bed for their new pup. It would just crawl into its little space and sleep peacefully. Now, the dog still loves his sleeping area but is getting a little too big for it. It might be time to invest in a bed. 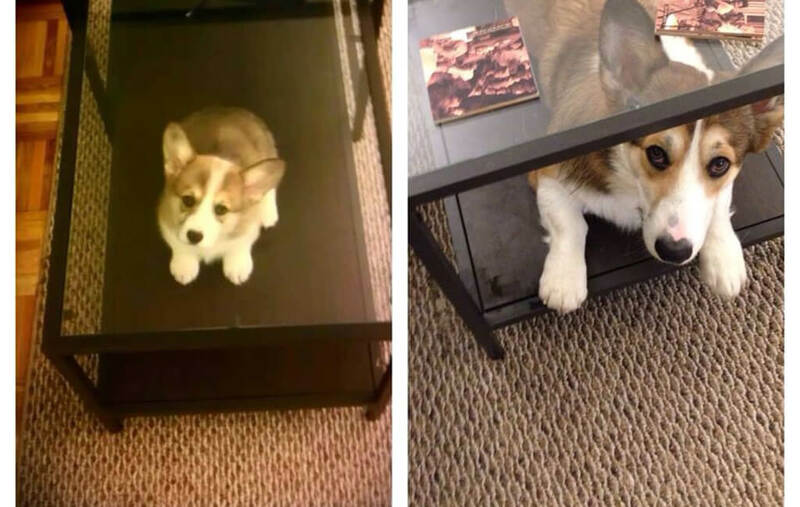 Even though this pupper has changed a bit from the first picture, it doesn’t mean that their favorite spot to nap has changed. They probably chose this spot because they really like the outdoor breeze while still sleeping inside. It’s also a great spot to encounter any human trying to come inside or go out. Usually, most puppies are a little anxious at first to ride in cars, and we don’t blame them. They’re loud, fast, and a lot different from their usual home. However, this dog seems oddly comfortable during this car ride. So much that it’s even fallen asleep. It looks like after some time, it still doesn’t mind the car as long as it gets the same seat. 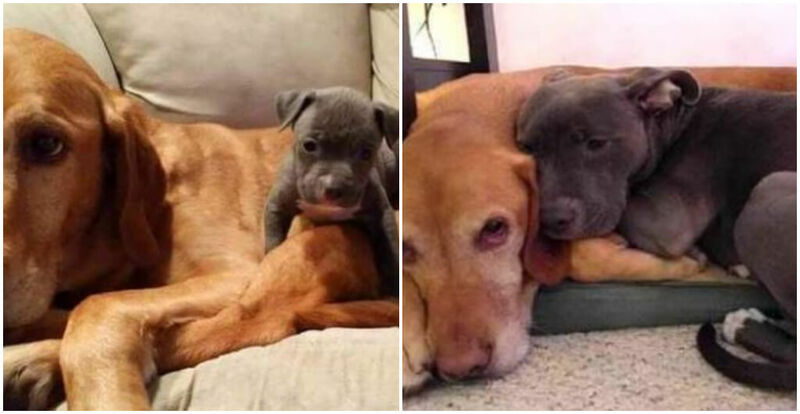 It looks like when this dog was just a puppy, he laid on his big sibling so he felt safe when he took a nap. While that may be understandable, you would think that maybe they would eventually grow out of it. Apparently, not this guy! He realizes he has a good situation going and isn’t going to change anytime soon. 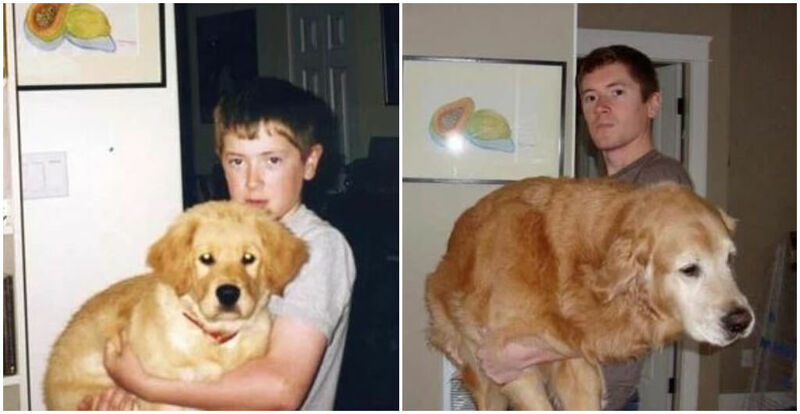 It’s clear from the two pictures that these guys have been best buds for a long time. While originally, it was the young boy’s job to protect his puppy, we’re sure the dog now feels the same response about its owner. 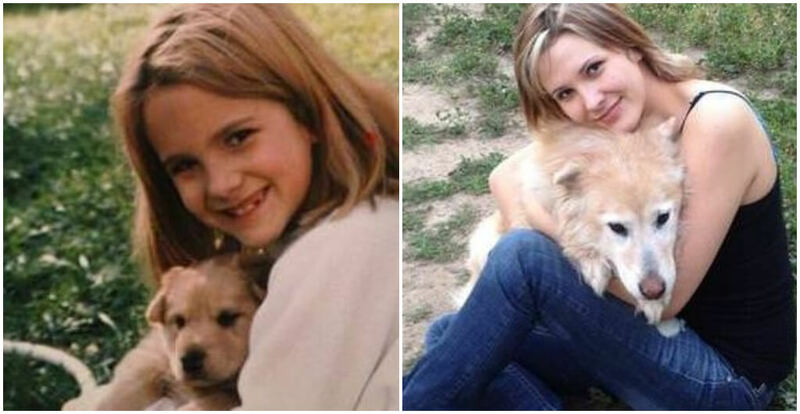 While they both may have matured since the first picture, they still look happy as ever. 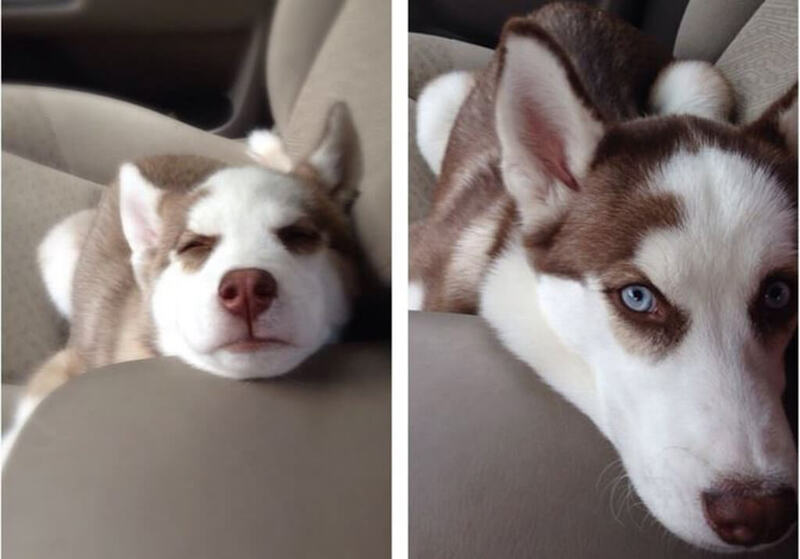 This picture was only taken three months apart! So if you were ever wondering how fast labs grow, this should give you an idea! 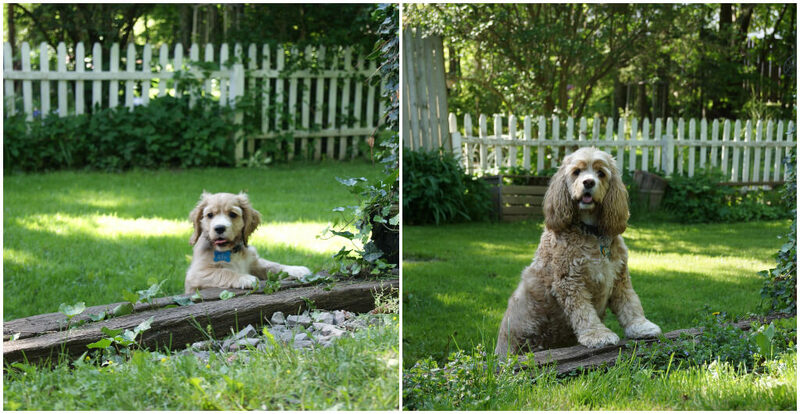 In just three months this little pup outgrew their favorite spot like nothing. Although they could find a new spot, we doubt that will happen. 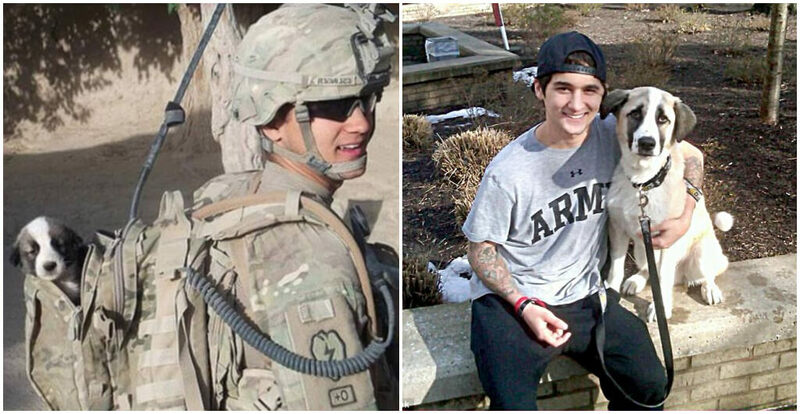 20-year-old Donny Eslinger was serving in Afghanistan when he found a tiny stray puppy. He took in the dog as his own and named it Smoke. After being wounded in battle, Donny was forced to leave Smoke behind and go home. Family and friends raised enough money to bring Smoke home and the two were reunited. This is another picture to remind of how big puppies can get although they seem like they’ll stay young forever. It’s also a reminder that some dogs come out a little different than you may have thought. 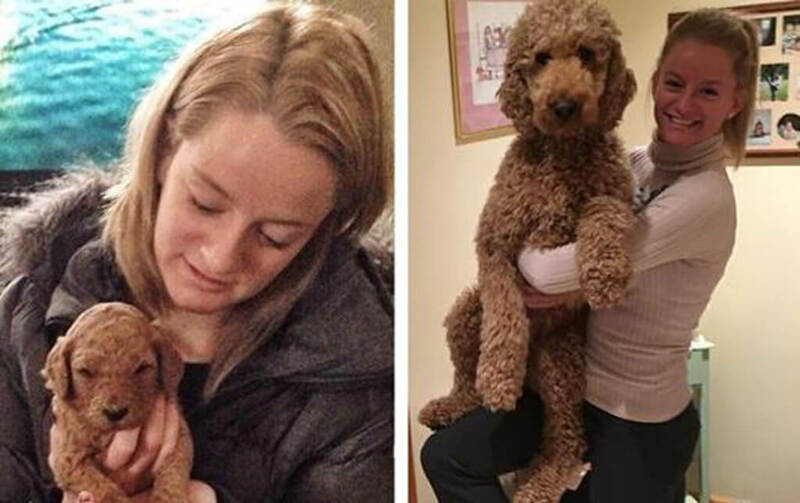 What looks like a Golden Retriever puppy turns out to be much different as a big dog! 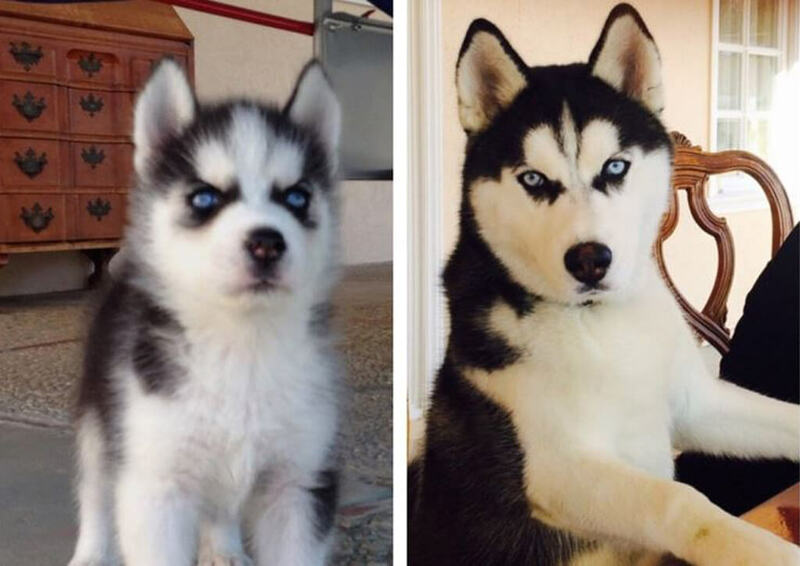 Even as a puppy this dog has a serious attitude. Maybe it can’t help or, or it’s actually as cranky as it seems. Yet, no matter how cranky it is, it’s still adorable. Apparently, this dog is known for destroying all of her stuffed animals except one. She’s had it since she was a puppy and always sleeps with it. Is it a coincidence that it just looks like her? Probably not. But it’s one of the cutest things that we’ve seen in a while. Sometimes, no matter how old a dog is, they will still be just as clueless like when they were a puppy. This is the case for most dogs and especially this one. We’re not sure if they like the feeling of having their ear turned inside out, but it’s a good look for them either way. Do you, doggo. This is probably the biggest dog we’ve seen so far, and that’s saying something. We’re convinced that is part bear or something because it’s big enough to make the owner disappear entirely. What are they feeding that beast? That’s biggest make anyone stare when you take that for a walk. It’s still adorable though. 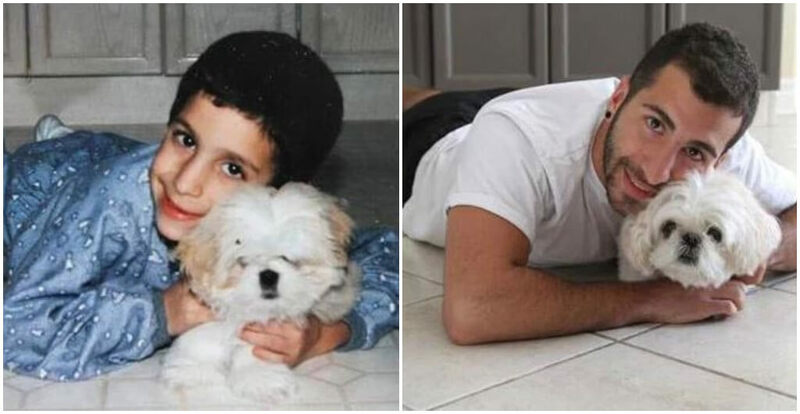 Not much has changed from the first picture except that the little boy is now a man and the puppy is now a dog. We wonder how far apart these pictures were taken because it certainly looks like a lot has changed! We’re just glad that dog is still around! 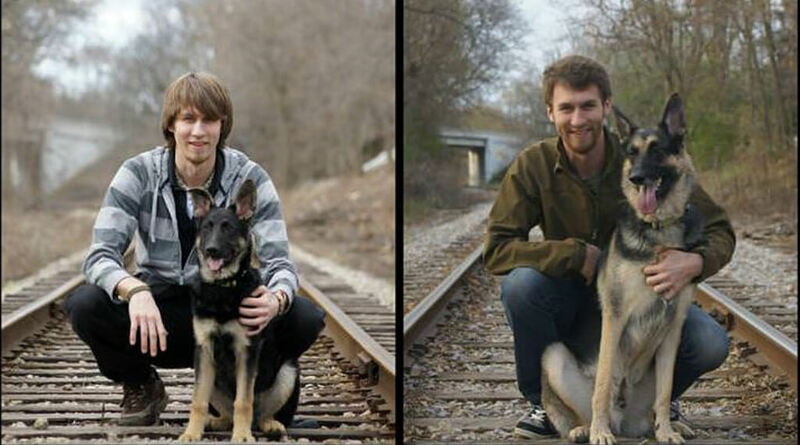 These two pictures were taken 10 years apart and the differences are clear. However, one thing looks to be the same. That dog is not that happy being held. We think that it’ll be alright for the sake of taking these two awesome pictures. Cheer up doggo! 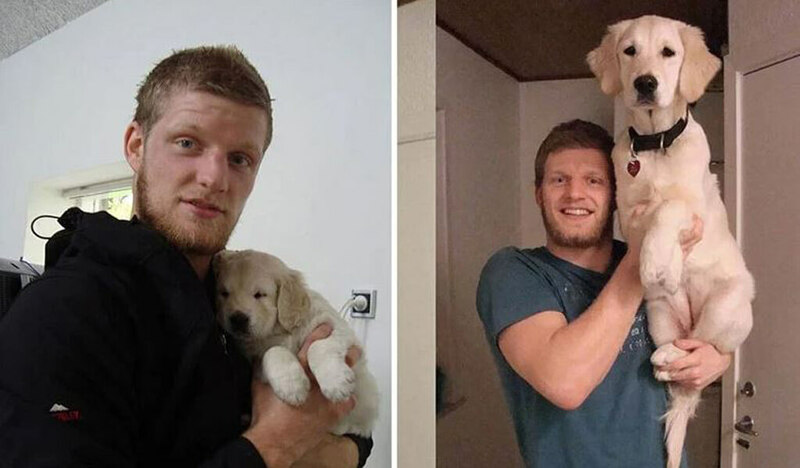 Ever since it was a puppy, it doesn’t look like this puppy ever mind being held, maybe it even preferred it. 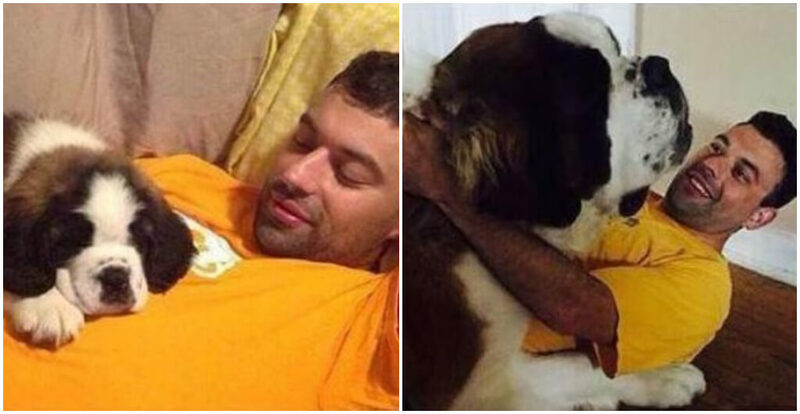 Look how content it looks in the first picture all snuggled up against its owner. Even as a big dog it still seems to be pretty okay with it. Some things never change. These two pictures were taken in 1998 and 2012. It shows that a lot can change in 14 years. 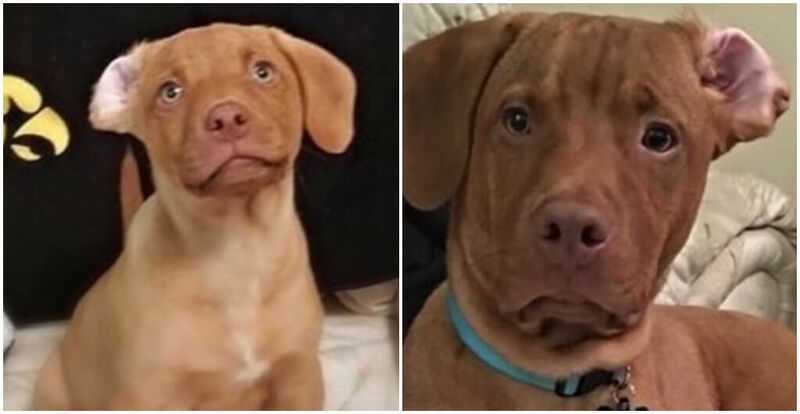 While they puppy may look shy in the first picture, that’s certainly not the case in the second one. It must have become more comfortable in the last 14 years and is even smiling in the second photo! Two years have passed from when these two pictures were taken. That dog used to fit in the palm of her hand like a kitten, but that’s now out of the question. A lot has probably happened over the last two years, but these two seem inseparable. Like some of the other dogs we have seen, this one doesn’t seem to mind being held. Sure, it may look a little confused in the first picture, it looks nothing but happy in the second. We also appreciate the effort for the owner wearing the same outfit for both pictures. That’s dedication right there. 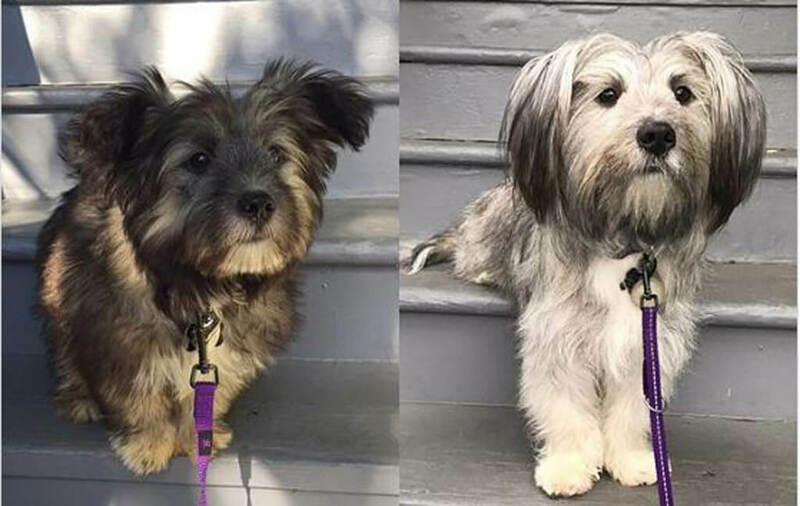 While this may even look like a completely different dog, all it is its hair has turned right. If you ask us, we think that it makes the dog look much more distinguished and wise. Odds are that the younger dogs in the neighborhood come to this dog for some life advice. 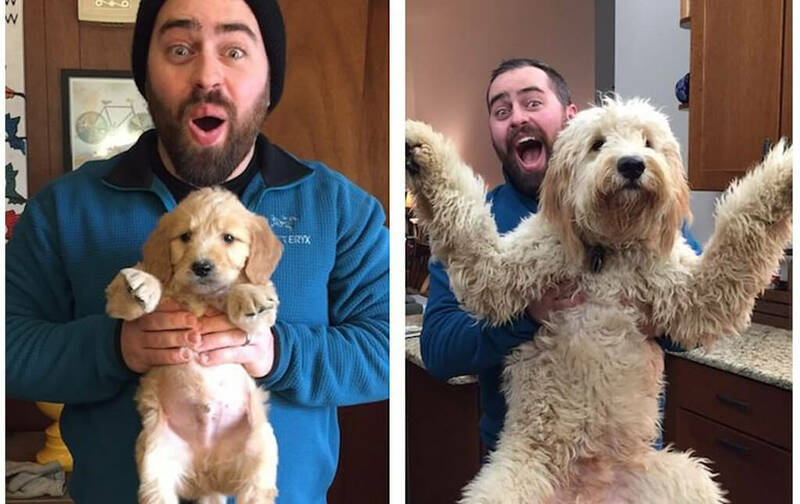 We’re actually not sure which picture is cuter. The puppy enjoying its bone with those puppy eyes, or it all grown up and proud of itself for graduating dog training. We guess they’re equally cute in their own ways but we wish we could have one of each. While at one point, that puppy could probably curl up on its food tray, it now chooses to lay directly on top of it. 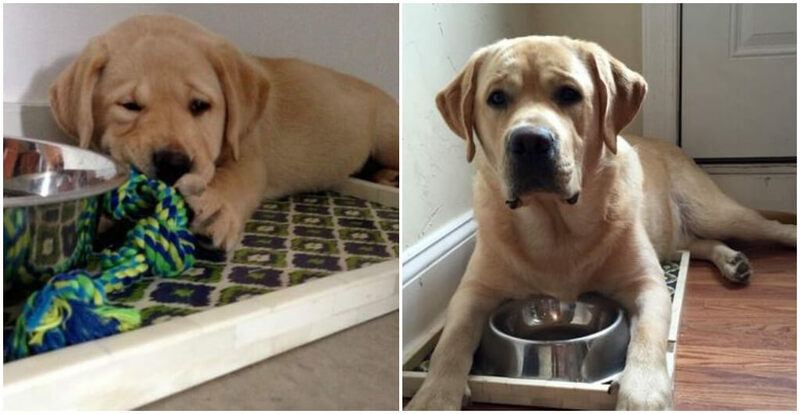 It looks like its a habit that will only get cuter as the dog gets older. We’re most surprised that the dog didn’t chew up all that wood siding yet. 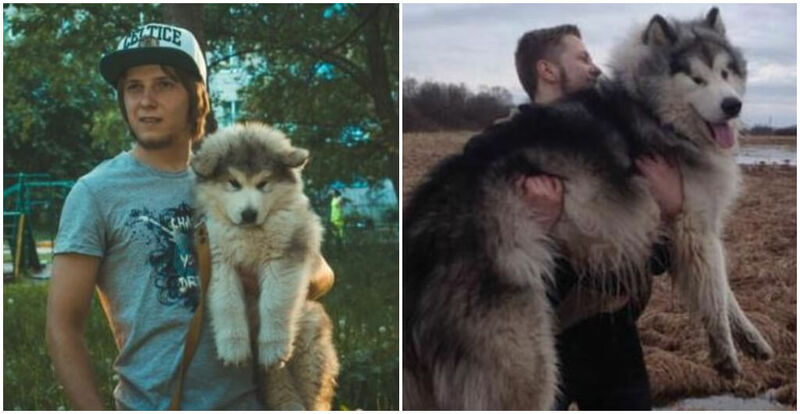 The first picture was taken when this Alaskan Malamute was just eight weeks old and the second was taken after a year. 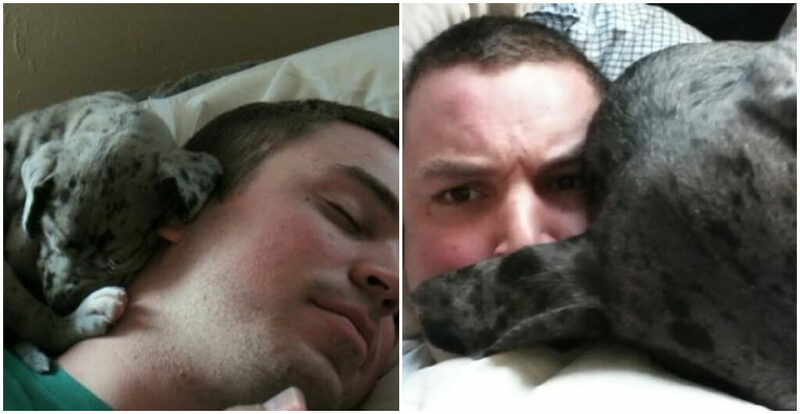 In the first picture, it almost looks like the dog is laughing and in the second…not so much. 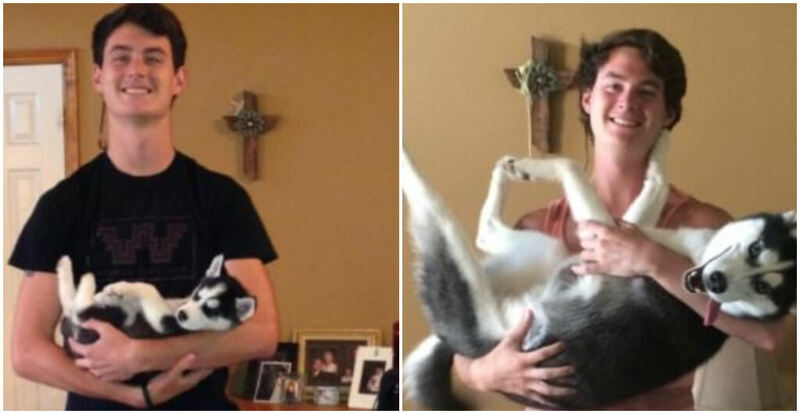 We’re sure it’s a happy dog, maybe it’s just not a big fan of being held.